Do you know Seedling? They’re a New Zealand company, and they design these beautiful projects for kids to make, sidestepping cheap pink plastic and hyper-gendered projects for more wholesome, more universally appealing crafts with materials like wood, felt, canvas. They come in fairly small packages, which I’m convinced would be perfect to throw in a carry-on for a long plane ride or just to take on vacation to keep the kids busy when they need a break. I’ll be testing that thought later this year whenever we travel next, definitely. The projects are about the process of making something that’s decent quality, and will give kids a sense of pride for making it, and something you’d want to keep as a treasure and actually use. They are not above throwing around glitter and sparkles, and some of their kits certainly may appeal more to girls or boys. But, they’re not driven towards one gender over the other, which is another reason I love them. So many craft kits are heavily marketed to girls, with throwaway pink sequined mirrors or an endless parade of friendship bracelets and diaries. I love the Seedling projects because they inspire a little more imagination than that. They are to craft kits what Melissa & Doug are to preschool toys. Seedling has a mirror kit, but it’s a spyglass mirror. There is a diary, but it’s a simple notebook that encourages you to create something incredible on the inside. There are superhero capes (in blue or pink), pirate peg people, boats to build, mermaid dolls to sew. Masks to embellish, different holiday-themed crafts, just tons of great stuff. 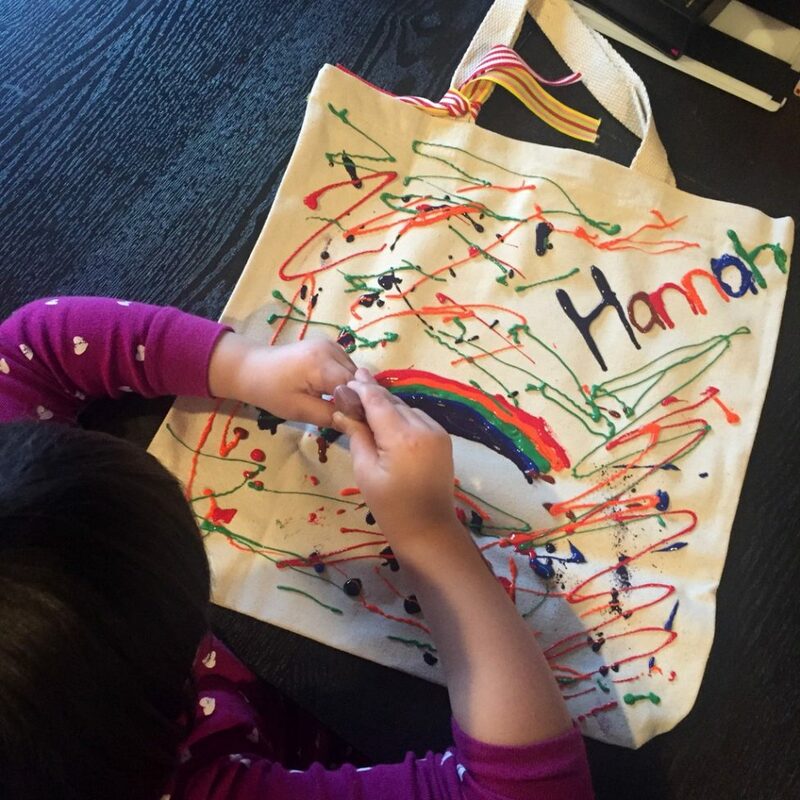 H got the tote bag kit in that photo above from her Uncle Thomas. We made it at the end of Christmas week, after NYE, when things had calmed down after all the family visits had happened and presents had been unwrapped. After she’d played with toys and we started organizing and getting things into their new homes, she really wanted to dig into the kits and make something. So we parked at the kitchen table and made this bag together. A complete project, that my sensory, hypotonic four-year-old loved and had an absolute blast decorating the way she wanted it. There were fabric sheets in the project box, too, but she just wanted to paint her heart out. It was exactly what she needed after a great, busy holiday week to help feel like she’d really finished something. It took a good 24 hours for this bag to dry, but now it’s her own big tote bag. It basically lives in my car, where she can load it up with treasures to have on hand at all times. This is so very important to a four-year-old, after all. 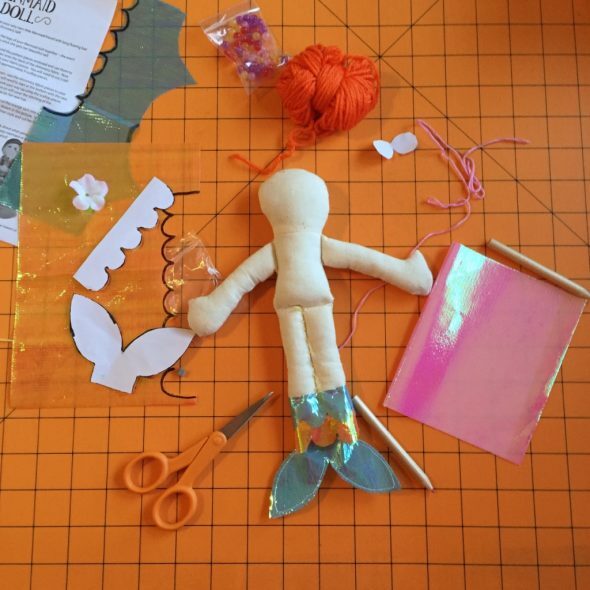 Our friends Paul and Kim sent her the mermaid doll kit, and we’ve started that one but haven’t finished it yet. H wants to cut, but she’s less excited about hand sewing. She loves sewing cards, though, so we’re working on it. I’m trying to teach her a healthy respect for sewing needles without being intimidated by them, because she also seems really interested in learning to use a sewing machine lately. But, I want to get her practicing with these hand projects first. I mean, this kit is just adorable. Whenever we finish this mermaid, she’ll be delightful to play with. I can’t recommend these kits enough. I’m probably going to get another couple of kits for H to add to our craft supply closets, for those days when you want to make something, but you just want to get started and not hunt around assembling all the materials. Easy projects for me to organize, easy projects for her to make.